After Tom Woodforde uttered those words loudly in Savage’s Reading Room in Taunton, Somerset in front of a group of other gentlemen, a report found its way back to James Vibart, a half-pay Lieutenant from a prominent family in the town. Outraged that Woodforde had traduced the character of a respectable married lady and, as his lawyer later put it, “attempted to destroy the honour and happiness of a whole family,” Vibart called on him one evening, bludgeon in hand. A violent altercation ensued as the two men, both now armed with sticks (Woodforde must have grabbed one or been given it), beat each other all the way up Taunton high street, attracting a crowd of spectators. It must have been excellent entertainment for the ordinary townsfolk: seemingly respectable gentlemen did not often fight in public screaming “Murderer!” and “Midnight assassin!” at each other. Hammet Street, Taunton via rareoldprints.com. The high street can be seen at the end of Hammet Street. John Fitch saw Woodforde on his hands and knees outside his house. “Curse your soul, you scoundrel, get up!” shouted Vibart, and, as Woodforde did so, brought his bludgeon down on his arm. “What do you mean to do?” asked Woodforde. “You mean to kill me with that stick,” said Woodforde. “No, it’s just to give you a drubbing!” replied Vibart. Woodforde received blows on his head, head, face, back and body. Two hours of fighting left him covered in blood, but he managed to get home. His arm was in a sling for a week afterwards. 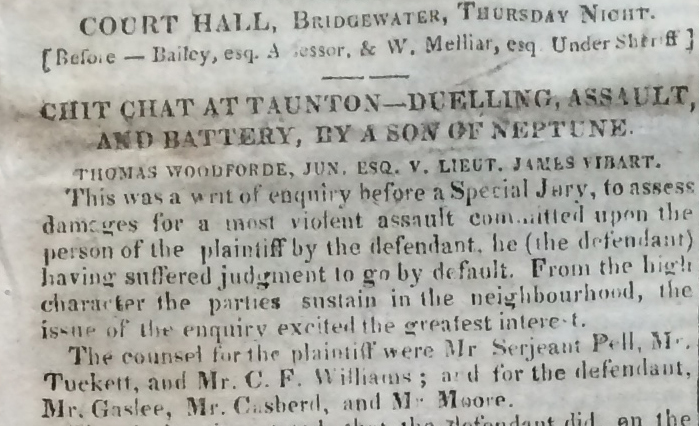 “A great deal of abusive language passed on both sides,” reported The Observer[ref]17 August 1817[/ref] coolly four months later when Woodforde brought a case against Vibart at Bridgwater’s Court Hall, 12 miles from Taunton, heard by Judge John Bailey. Vibart’s lawyers did not dispute that he was at fault for the assault but tried to mitigate damages awarded against him by detailing the outrageous slur Woodforde had cast. In the end, the jury awarded him a hundred pounds. Abraham Moore (1766-1822) was from a Devon family of clergymen. Having been called to the bar, he went on the Western Circuit, worked as a special pleader and held other legal offices in Kent and London. At the general election of 1820 he was returned as as member for Shaftesbury, his patron being the first Earl Grosvenor. At the beginning of August 1821, Moore fled to America having, as Grosvenor put it, “turned one of the greatest scoundrels in existence” by leaving his patron in debt for the “frightful amount” of £80,000. He and his wife died of yellow fever in New York in late 1822, leaving six young sons. Robert Matthew Casberd (1772-1842) was the son of a Bristol doctor. Educated at St John’s College, Oxford, he became MP for Milbourne Port, a “Scot and Lot” constituency of about a hundred voters, from 1812 to 1820. Albert Pell graduated from St John’s College (he was a contemporary of Tuckett’s). He had arisen from humble beginnings in the East End of London and was known for his work ethic and intelligence. As a young barrister on the Western Circuit, unable to afford transport between Assize towns, he had opted instead to walk. He was a serjeant-at-law. Stephen Gaselee (1762–1839), son of a Portsmouth surgeon, was known for his encyclopaedic knowledge of the law. Like Tuckett, he had trained under the acerbic Sir Vicary Gibbs. He was appointed KC in 1819 and was later made a judge in the Court of Common Pleas. The case will be of interest to those who have read my book The Disappearance of Maria Glenn, as it featured so many of the people who played a major role in her story. Maria’s uncle, George Lowman Tuckett, was on the prosecution team. A year or so after this case, he and Woodforde were sworn enemies, with Woodforde actively trying to destroy Tuckett’s niece Maria’s reputation. In fact, all six lawyers in the Woodforde v Vibart case were involved in legal actions concerning Maria. In August 1818 at Dorchester Pell, Williams, Moore and Gaselee represented Tuckett in his case against the Bowditch family, and Casberd, Moore and two others defended them. In addition, John Bailey was on a panel of four judges who later handed down a decision on whether the Bowditches should be retried. My research into Tom Woodforde revealed him as an unscrupulous and aggressive operator, his support of liberal and progressive causes notwithstanding. It is interesting that his barrister Charles Frederick Williams described him as having “filled judicial and other high situations” in India. In fact he was sacked by the East India Company for disrespectful behaviour at a Muslim funeral, something his lawyers and the people of Taunton were probably unaware of. The Taunton Courier did not carry this story – its editor was a friend of Tom Woodforde’s father – and I have not found it anywhere else so far.